Go away now, Mum, I'm trying to sleep. Why don't you take it easy this Sunday? I can see we have more work to do on the 'how to make your human more cat' course! Listen to her. It's so much FUN trying to live like my cats! PS. One downfall, Nothing gets done!!!! 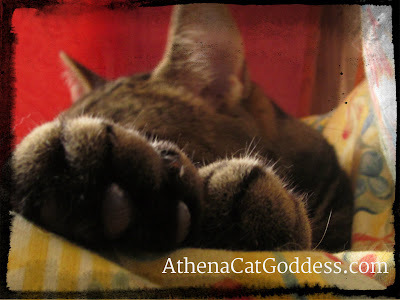 I'm keeping my paws crossed for a no-photo Sunday too! Humans...they just don't get it, do they? Peeps are always waving the flashy box around at I opportune times. It's an upward struggle, Athena!! Very cute! I love the fuzzy paws :) I don't know how much luck she'll have with turning humans into cats, but cats do a great job at training humans to suit their needs! She's succeeding in the training part. There's nothing I wouldn't do for her! Yes, my mum definitely has to adapt to cat ways more! Luckily for me, my mum doesn't use the flash on her box. She tries to take my photos in good natural light. No pawparazzi for me yet as I'm not famous enough, just my mum and her crazy photography obsession! Wishing you a calm and easy Monday! Popping over to your site to have a look now.